Current acid treatments require a prolonged treatment period and are often difficult to apply in a convenient and targeted way. The Wartner Verruca & Wart Removal Pen is based on the acid/liquid method. It effectively eliminates warts & verrucas in a short time period, whilst providing users with an innovative and easy to use applicator. 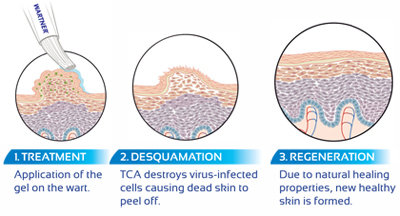 The TCA gel used in Wartner Verruca & Wart Removal Pen offers a unique treatment proposition compared to conventional salicylic acid based liquids and gels. This innovative product is based on chemical peeling using Trichloroacetic Acid. Carefully apply the dispensed gel only on the wart or verruca (avoid touching healthy skin surrounding it). If accidently applied on surrounding skin, please wash off immediately. Forming a drop may require several multiple turns when used for the first time. The Wartner Verruca & Wart Removal Pen should be applied twice daily for 4 days, then a break period of 4 days should be taken. If necessary, treatment can be repeated up to 4 times (only 1 drop of gel is needed per application). If the wart (or verruca) is small (size of a needle point), only apply the gel once a day.